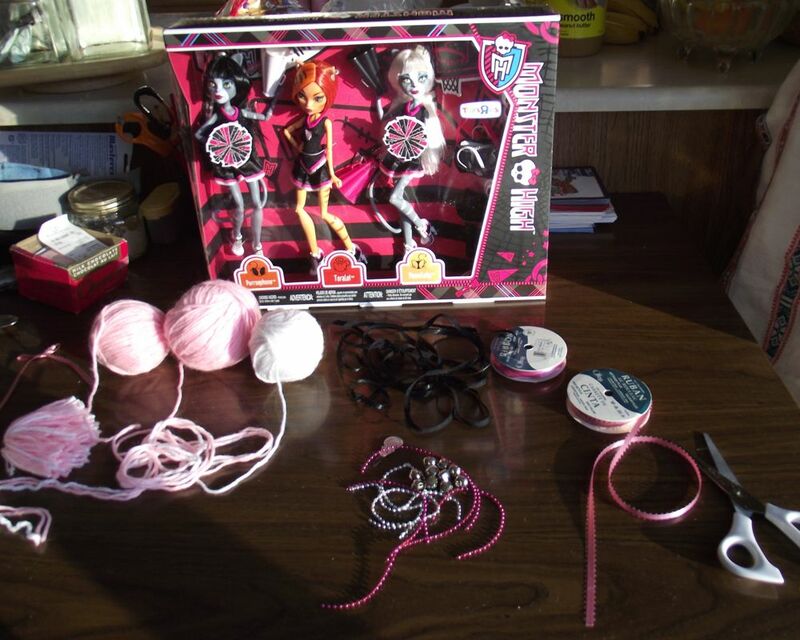 This is a craft project that is ideal for fans of the Monster High dolls. Great for Fear leader or cheer leader dolls these yarn pom poms are cute. I recently purchased each of my granddaughters the very popular 3 pack set of the Monster High Toralei Stripe and Werecat sister dolls.The dolls themselves are absolutely gorgeous. Dressed in their matching Fearleading outfits they are the gift that my girls most wanted for the holidays. There are other accessories included in this doll set but I was surprised to see that the teen ghoul cheerleaders did not come with usable pom poms. 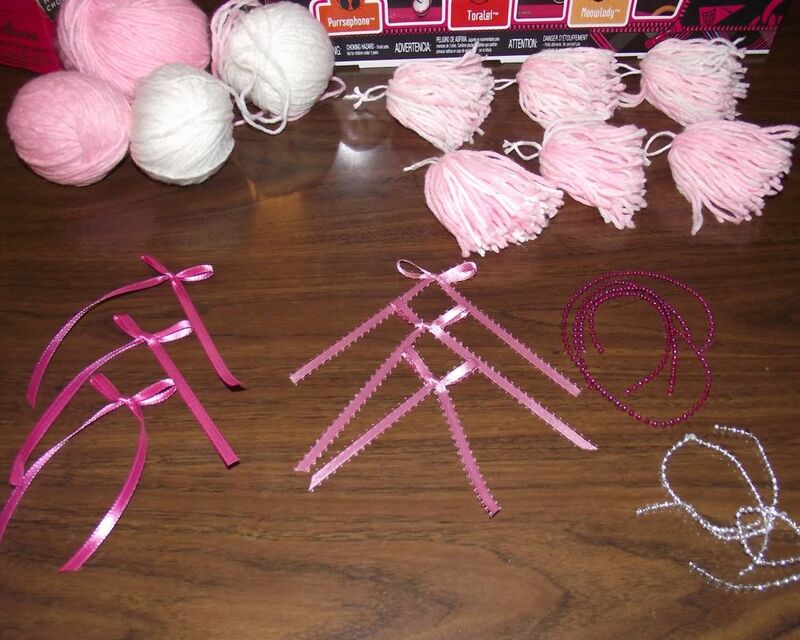 Cheerleaders need pompoms so I decided to make some very special sets for my granddaughters new Monster High doll set. *Three skeins of Yarn (You will only use a bit of each). You can use any color combination that you think will look good but try to choose at least two colors to combine into your pom pom. 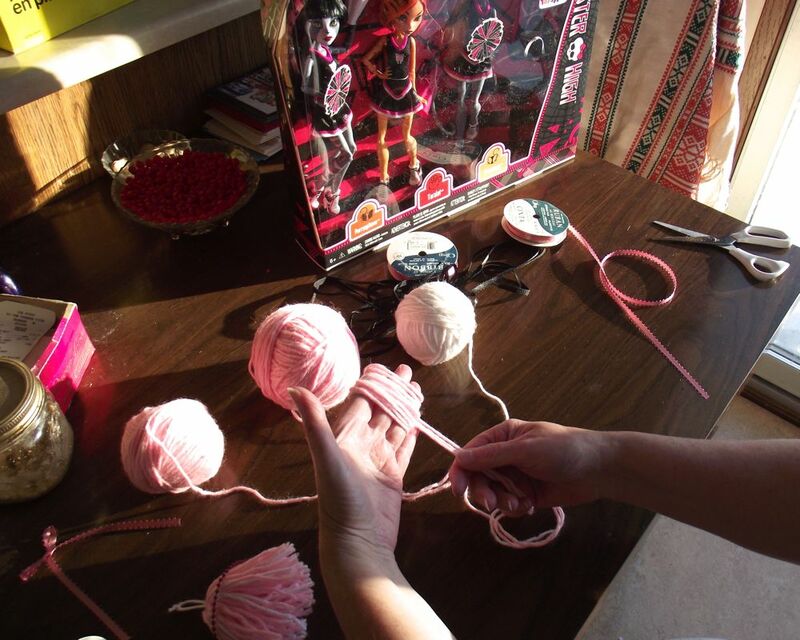 As the Werecat Fearleading outfits are pink and black I combined white and pink yarn to make mine. *Ribbon. Coordinate your ribbon color with your yarn color choice. *Tiny strings of beads. (One for each pom pom)Your choice of coordinating color. *A 6 inch piece of yarn for each pom pom that you make. This is used to tightly tie your pom poms so the threads stay in place. *One bell for each pom pom. The three werecats that are in the Fearleading squad are delightful teen ghoul dolls. Each with her own unique personality the Monster High dolls are some of the most popular toys for young girls each year. The ghouls are very active at their high school and Toralei participates in many sports on and off of school hours. She is a wild cat who really does know how to play. Toralei is an alley cat orange ghoul and one of the very popular Monster High teen dolls. She can be nasty tempered but that is because she was raised as an alley cat. Toralei really can be quite sweet when she want to be. Use the needle threader to place a bell at the center of each 6 inch strand of yarn. One for each pom pom. I am using 3 rolls of yarn. Two rolls are pink and one is white but you can use any color of yarn that you prefer. For a short puffy pom pom you will wind the wool over two of your fingers. For a longer pom pom which is what I have made you will wrap the wool over three of your fingers. 1. You will need to wrap the three strands of wool over your fingers 20 times. 2. Pull the 6 inch strand of yarn with bell attached near the top and through the center of your loop. Tie the string into a tight knot so that it draws the upper part of your threads together. Your bell should be inside the loops. Then cut yourself free from the balls of yarn. 3. Hold your strands together and cut the yarn loop in two by cutting across the bottom of your yarn loops. 4. With your long strand (from the strand with the bell attached to it) tie a small loop that will be used by the doll to hold the pom pom. Cut remaining yarn off. Cut your ribbon and beads into 6 inch strips one for each pom pom. Form each ribbon into a bow. Using the glue gun put a drop of glue at the top of your pom pom. Quickly attach the beads and bow.